The years immediately following World War I brought about many changes in the world, notably, the creation of new independent nations. Perhaps not particularly outstanding in the eyes of civil rulers and officials, but in the eyes of Almighty God, a chapel was established on Webster Avenue where Divine Services were conducted by the priests of Our Lady of Mount Carmel Parish in West New Brighton. The pastor of Mt. Carmel, Father Louis Riccio, was already known for his zeal in providing the Italian-speaking families with spiritual leadership and guidance. It was not long before it became apparent that a resident pastor was needed for the new chapel. The Archbishop of New York, Patrick J. Hayes, appointed Father Carmelo Crisci to be the first pastor of the newly organized Assumption Parish in New Brighton. The parish began to grow to such an extent that the chapel had to be enlarged within only a few months. Work on this project was accomplished with the aid of a zealous committee. Soon, however, this expansion also proved to be inadequate and plans were eagerly made to construct a new permanent church. Permission was obtained from the Archbishop, a parish committee was formed, and on December 27, 1921, a contract was signed with the Niewenhous Company, Inc., New York City. A spirit of great joy came over the parishioners as they witnessed the rise of the Italian Renaissance style structure on the corner of Brighton and Webster Avenues. On Sunday, April 23, 1922, at five o&apos;clock in the afternoon, the Very Reverend Monsignor M. J. Lavelle, Pastor of the St. Patrick&apos;s Cathedral, New York, laid the cornerstone by delegation of the Archbishop. On Sunday, August 6th, the Very Reverend Monsignor Charles H. Cassidy, Dean of the Borough of Richmond, blessed the new bells, and on Tuesday, August 15th, the Feast of the Assumption of the Blessed Virgin Mary, the new church was solemnly dedicated by the Right Reverend John J. Dunn, Auxiliary Bishop of the Archdiocese of New York, and opened for public worship. Within a very short period of time, this section of New Brighton was able to provide a suitable place of worship for the work of the spiritual regeneration of the parishioners. In addition, one of Father Crisci&apos;s strongest hopes was to erect a school in the parish. Father Crisci saw much work ahead; the Catholic education of the children and the integration of the young men and women into a unified spiritual force called the parish. The years that followed were not without hardship and sacrifice. The total debt for the land, church and rectory (which was built a few years after the church) amounted to about two hundred thousand dollars. It was a huge debt to overcome and the years of the Depression following 1929 made the burden seem even heavier. January 1, 1937 saw the arrival of our second pastor. Father Joseph A. Catoggio. Having found a substantial church building and rectory in the parish and a longstanding debt accompanying them, the obvious desire of the new pastor and his parishioners was the liquidation of the debt. Through the next decade and in the face of many difficulties and obstacles, Father Catoggio made every effort to accomplish this along with attending to the spiritual needs of the parish. In the Summer of 1953, the parish undertook to finance a much needed redecoration of the church and the rectory. A hard working committee was organized to obtain subscriptions for the project and at the end of that year everything was satisfactorily completed. The third priest to be appointed pastor of Assumption Church was Father Charles F. Rizzo, who arrived on December 7, 1954. The new pastor was also confronted with the challenge to reduce the existing debt with the added responsibility of establishing a parish elementary school. The original debt on the parish was finally paid on December 31, 1956. This cleared the way for further development. There was an obvious need for a parochial school and the pastor zealously set put to direct the parishioners in accomplishing this project. On October 25, 1959, permission was obtained from the Archbishop to acquire property for a school. Work was immediately begun and property was purchased on the corner of Brighton Avenue and Kingsley Place. Things then began to move rapidly and on March 6, 1960, the Campaign Fund Drive was officially opened with the blessing of the workers by His Excellency, Joseph M. Pernicone, Auxiliary Bishop of New York. In this period joyous news arrived that His Holiness, Pope John XXIII had appointed Father Rizzo a Domestic Prelate with the title of Right Reverend Monsignor, and on March 27, 1960, Monsignor Rizzo was invested with the robes of his new appointment. Later that same year, on August 15th, the ground was blessed and broken for the new school by Bishop Pernicone. Work was subsequently begun and on July 16,1961, the cornerstone was laid by His Excellency, John J. Maguire, Auxiliary Bishop, and Vicar General of the Archdiocese. When the school year opened in September, 1961, Assumption School officially began with the first four grades of elementary level. 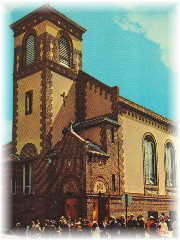 Since the new building was not yet completed, the children attended classes in the old school of St. Adalbert&apos;s Parish, Elm Park, Staten Island, It wasn&apos;t until March 19, 1962, the Feast of St. Joseph, after a Solemn Mass of Thanksgiving and Procession to the new school, that the building was occupied. Much to the joy of the parish and the educational welfare of the children, Monsignor Rizzo was able to obtain as teachers the Sisters of the Presentation of Staten Island. The day of the Solemn Dedication of the school was on Saturday, September 15, 1962, when His Eminence, Francis Cardinal Spellman, Archbishop of New York. It was indeed a day of great satisfaction and happiness. On October 14. 1966, Francis Cardinal Spellman asked Monsignor Louis A. Martorella, pastor of St. Lucy&apos;s Church in Manhattan, to accept the pastorate of the Church of the Assumption. Up to June, 1968, the parishioners who had children in Assumption School paid no tuition. Their only obligation was to contribute to the church support and pay on their school pledge. With the increases in teachers&apos; salaries, and rising expenses for church and school, however, Monsignor Martorella introduced tuition fees for all school children, those of parishioners and non-parishioners, as of September 1968. The additional money helped tremendously towards meeting most of the daily school expenses. Father said his first Mass at Assumption Church on Sunday, March 29, 1969. His first major project was the installation of a new altar. Through donations made by the parishioners, Father was able to renovate the entire sanctuary which consisted of painting, carpeting, and the installation of the beautiful marble altar shipped from Italy. The altar was consecrated by His Excellency, Bishop Joseph M. Pernicone, on Saturday, October 3, 1970. To match the marble altar, Father also acquired a new marble baptistry as of January 24, 1971. Following the renovation of the sanctuary, Father Lombardi then remodeling the church rectory which included a complete new roof, the partitioning of walls and the dropping of ceilings. Another accomplishment brought about by Father Lombardi was to restore the lower church hall. The restoration involved the painting of ceilings and walls, sanding of the floors and the installation of two basketball backboards used for youth activities. Father Lombardi had begun another enormous project, the painting of the church, reupholstering of church pews, and any other repairs necessary to beautify our church.